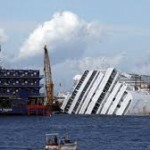 The Costa Concordia on its side. The trial of Schettino opened today, 7/17. Turns out his lawyers requested a plea bargain. Instead of going through a long and expensive trail, the former Captain would plead guilty and accept a 3 ½ year prison stay. There are 250 pending civil suits. 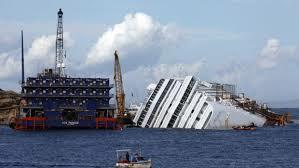 Good luck getting much money out of Captain Schettino. But the first in – get paid first. Salvage is planned for next year. Carnival Corp owns the Concordia and has announced 2014 plans to roll out a replacement – a new 132,500-ton, 3,700–passenger mega-ship.